We have recently produced a video series discussing Nozzle Air Entrainment for firefighters. In this series we took a look at 3 pairs of tests for a total of 6 videos. In this video we take an in depth look at nozzle air entrainment and hope this overall instructional video sheds a little light on the topic. Remember, you can reference the other test videos by viewing them in the overall Nozzle Air Entrainment Playlist. We will provide that playlist at the bottom of this article, but you will also be able to find the playlist on our website by clicking here or on our YouTube channel. This is the second round of videos from our Nozzle Air Entrainment Video Series. In these two videos we will look at the interior attack of a vent limited situation. This will give you a good idea of how a nozzle can over pressurize a space regardless of fire or heat. This is simply air entrainment causing this over pressurization. We will use two videos, one for the smoothbore and one for the fog nozzle. This will pick up where we left off with Tests 1 & 2. If you haven't seen the first two tests click here to watch those videos. Thank you for watching and keep an eye out for the next round of videos. We still have two more experiments to go and will release those next week. Today we have released the beginning of a 7 part video series on Nozzle Air Entrainment. 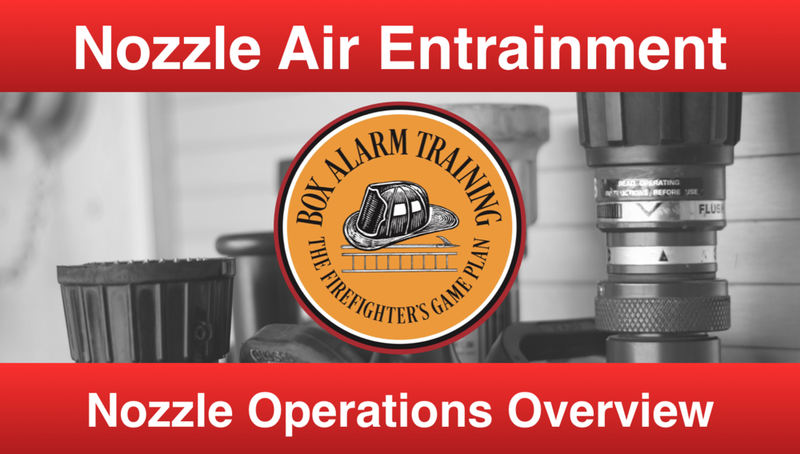 These videos will walk through some of the basic concepts of nozzle air entrainment and how you can deliver some hands-on practical drills demonstrating air entrainment with various nozzle types. We will release all of these videos over the next few weeks so keep an eye out as we move along. You will see below Test 1 and 2 which will begin our video series. Test 1 is an exterior attack through a window using a fog nozzle. We will begin the attack with a straight stream directed at the ceiling and then move the pattern through 30 degrees and towards full fog. You will see a drastic increase in air entrainment as we change the pattern of the nozzle. This fog nozzle was flowing 125 GPM at 100 psi nozzle pressure. Test 2 is the same test but we are using a 7/8" smoothbore nozzle. You will see a decrease in the air entrainment even with the increase in flow. This 7/8" tip was flowing 160 GPM at 50 psi nozzle pressure. You will see several more of these tests coming out over the next few weeks. The next tests include interior attacks both ventilated and non ventilated.